The specification list and look of the Olympus VG-160 certainly aren't going to impress many photographers. Everything about this camera's look screams budget-priced under performer However, if you're someone who needs to shop for a camera in the sub-$100 price range, the VG-160 is going to give you a couple of surprising pluses. The VG-160 does a really nice job with flash photos, has a fast start-up, and has a 3.0-inch LCD screen. There certainly are plenty of drawbacks with the VG-160, but nothing that's a surprise for a camera in this price range. If you're shopping in the sub-$100 price point, the VG-160 will give you decent performance levels versus its peers. Read more in our Full Conclusion. When it comes to being small, the Olympus VG-160 is about as thin as they get; 19.3mm thin to be exact. And yet, despite being able to fit in palm and pocket alike, the VG-160 has a feature list that many will find appealing when you consider the camera's sub $100 price tag. A 14-megapixel CCD sensor captures light through a 5x optical zoom lens (35mm equivalent of 26-130mm). Review all your photos on the 3.0-inch LCD screen and then adjust everything using Olympus' Magic Art Filters; new filters like the two-toned Punk and the twinkly Sparkle and the painting-esc Watercolor join classics like Pop Art, Pin Hole, Drawing, Fish Eye, and Soft Focus. Or, if you'd rather let your still images look as natural as possible, iAuto (Intelligent Auto) has you covered, choosing between 29 built-in scene modes to optimize your exposure settings. AF Tracking, Shadow Adjustment Technology, and Face Detection help track you subjects. And, like many modern cameras today, the VG0-160 also records HD movies (here, in 720p). 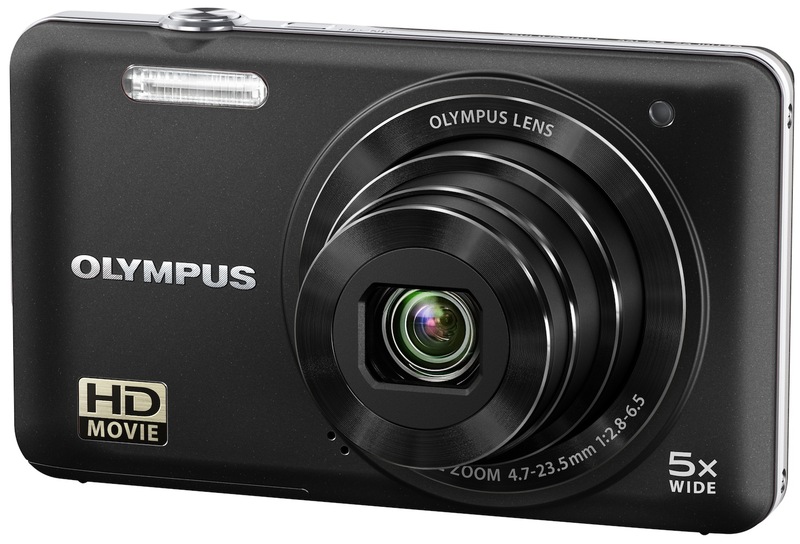 The Olympus VG-160 is available in silver, black, red, and orange, with a suggested retail price of under a $100 USD. See our lowest price button at the top right of this page to see the most current online pricing.